Liechtenstein is a small, soft-spoken country tucked away between Austria and Switzerland. She is very close to Switzerland, whom she looks to as an older brother even though there is no blood between them. Liechtenstein relies greatly on Switzerland, so much to the point where his military protects her. There is no border control between the two countries, therefore any resident of Liechtenstein or Switzerland can travel freely between the two. Switzerland first met Liechtenstein shortly after WWI. Even though she was not involved in the war, she was surrounded by countries that were, and soon famine and poverty struck. Right when she was on the verge of collapsing and losing her status as a country, Switzerland came to her rescue and adopted her as his little sister. It was shortly after this that Liechtenstein came to respect and adore her “brother.” Liechtenstein, who wore her hair in long braids, even cut her hair in a short bob just so that she would resemble Switzerland more. She is described as being humble, mature, and surprisingly high-tech. Liechtenstein is always one to clearly and bluntly state her opinions, but she can become very shy at times. She is also shown to be very self-conscious, especially over the fact that she has a flat chest. Once while walking with Switzerland, Swiss military uniform clad, she was mistaken as his “little brother.” Because of that, Switzerland took her out shopping for a ribbon of her choice to wear in her hair to make her look more feminine. This blue ribbon can almost always be seen tied on the right side of her head. She also appears to be a very talented seamstress, as shown in a strip of the manga (which was also put in the anime adaptation), in which she gave her brother a pair of frilly pink pajamas that she apparently made especially for him. 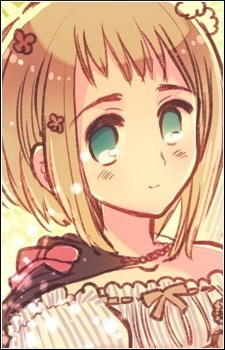 Although her official human name has not been decided, Hidekaz Himaruya revealed in a blog post that he has considered “Elise,” “Erika,” “Eva,” and “Sisia” as possible names with the possible surname “Vogel.” Since the decision has not been made final, fans often render her name as “Lili” (which is derived from Liechtenstein, and is also an altered spelling of the national flower of Liechtenstein, the lily).